“Our lending policy is: as many books as you want, for as long as you want. We want people to take the time to live with the books as long as they need to, to figure out how they fit into the larger picture of how they live.” -- Dawn Finley, FLOW In this episode, we ask the questions: What does it mean to be a radical, community library? What are the goals, responsibilities, and impacts of such an organization? We do so through conversations with Laura Moulton of Streetbooks, Melissa Marturano of Books Through Bars, Dawn Finley of FLOW, and Julia of the ABC No Rio Zine Library. To learn more about Streetbooks visit their website at—http://streetbooks.org/ and read this NYT article about them: https://www.nytimes.com/2014/10/10/us/homeless-outreach-in-volumes-books-by-bike-for-outside-people-in-oregon.html To learn more about Books through Bars visit their website at—https://booksthroughbarsnyc.org/ Read an interview with founder vikki law—http://artfcity.com/2012/09/05/the-abc-no-rio-interviews-vikki-law/ and this NYT article: https://www.nytimes.com/2018/01/12/opinion/books-prison-packages-new-york.html To stay up to date about what’s going on in Pennsylvania Prisons see the links below: —https://www.washingtonpost.com/opinions/incarcerated-pennsylvanians-now-have-to-pay-150-to-read-we-should-all-be-outraged/2018/10/11/51f548b8-cbd9-11e8-a85c-0bbe30c19e8f_story.html?noredirect=on&utm_term=.49acb26c7a96 —https://www.washingtonpost.com/nation/2018/08/29/pennsylvania-prisons-are-locked-down-after-unknown-substances-leave-hospitalized/?utm_term=.ffa16cd982d —http://www2.philly.com/philly/news/pennsylvania-prison-department-corrections-john-wetzel-security-plan-books-through-bars-k2-20181019.html?fbclid=IwAR1mWpHFFCjSgWWiE0AXCKUUfGW6DQBoxmhyKHgcbfMc2KNCgtZdLbU8auA For those interested in what FLOW is up to: http://feministlibraryonwheels.com/ and https://lithub.com/the-feminist-library-on-wheels-a-roaming-tool-for-social-justice/. ABC No Rio Zine Library Contact Information: http://www.abcnorio.org/pcgi-bin/suite/calendar/calendar.cgi?request=detail&website=default&event_id=12029 A huge Thank You to Laura Moulton, Melissa Marturano, Dawn Finley, and Julia for engaging us in conversation and for the important work you do! 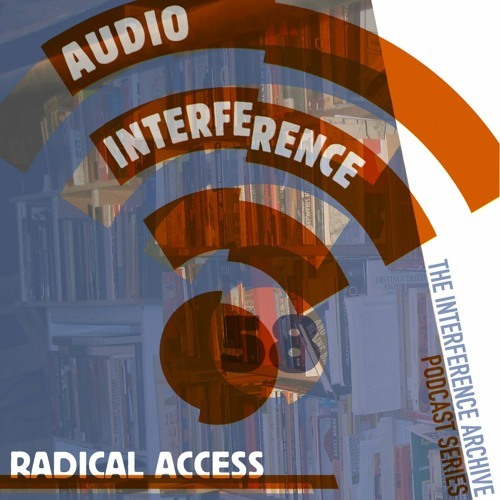 Stay tuned for Radical Access, Part II. Music: “Bronco Romp,” by Waylon Thornton; “Feel Good (Instrumental),” by Broke For Free; “Luminous,” by Broke For Free; “Live on BSR,” by Juan Wauters. Produced by Interference Archive.